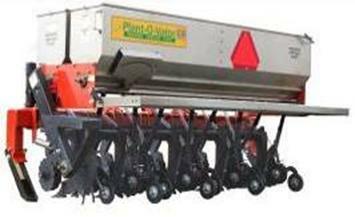 The Plant-O-Vator® is designed to create a mini seed bed 5½ inches deep for pasture renovation, fertilization and interseeding into living sod. to produce along with interseeded crop. More, lower cost forage per acre per year. • Use less diesel fuel. • Less wear and tear on your tractor. • Support for the environment. For more information visit www.sodbasedfarming.com discussing 22 years of work in sod with the Plant-O-Vator. Mini seed beds (5½ inches deep, 3 inches wide and 12 inches apart) also become reservoirs for water storage. Undisturbed area of perennial grasses flourish with this “cultivation”, fertilizer, water and resulting organic, humus buildup.